Banjo is one of the two protagonists of the Banjo-Kazooie franchise, along with Kazooie. However, his first appearance is in Diddy Kong Racing, in which he is a playable character. His inclusion was to promote his then-upcoming title, Banjo-Kazooie. Banjo has light-brown fur, and he wears a shark-tooth necklace, yellow shorts, and a blue backpack that houses Kazooie. Banjo is owned by Rare Ltd., a former second-party developer for Nintendo. In 2002, Rare was sold to Microsoft, and the rights of both Banjo and Conker were transferred to the company. In Diddy Kong Racing, when Wizpig invaded Timber's Island, Timber calls for Diddy Kong's assistance. In turn, he sends Squawks to contact his friends, one of whom is Banjo. All the characters compete in a variety of racing challenges to liberate the island and decide who would race Wizpig. Eventually, the eight racers, with the help of Taj and T.T., drove Wizpig back to his home planet, Future Fun Land. However, Wizpig returns, and the racers go to his homeworld. At the end of the world, the winning character races Wizpig again, who rides on a rocket missile for the rematch. On the character selection screen, Banjo's theme instrument is the banjo. The menu's theme is re-composed in a banjo when the player highlights him. Like the other characters, Banjo says his name when he is selected. As a heavyweight racer, Banjo has slow acceleration, which is compensated for a high top speed. His handling lies below average, but it remains an improvement over Krunch's. Banjo's has a top speed of 57mph without Bananas. Both Banjo and Kazooie made a cameo in early versions of Donkey Kong 64, but were ultimately cut from the final game. Their faces were going to appear on a shower stall in DK's Tree House. Banjo appears in some Diddy Kong Racing-based artwork in Mario Artist: Paint Studio along with the characters of the game. Since Microsoft had direct ownership over Banjo and Conker, both of them did not appear in Diddy Kong Racing DS. They were respectively replaced with Tiny Kong and Dixie Kong instead. Banjo's theme instrument was left intact, and it plays both the character selection and the game's introduction sequence. Banjo's statistics were also retained for Tiny Kong, who was likely redesigned for Banjo's heavyweight feature. Banjo appeared in the N-Gang comic "N-Gang vs. Nintendo", where he played on the same soccer camp team with Kazooie, Wario, Yoshi, Princess Peach, Donkey Kong, and Lanky Kong. Mario refereed the match. Originally exclusive to the Xbox 360 and Xbox One versions of the game, Banjo and a few other Microsoft-exclusive characters (including Conker) appear as playable skins in the Wii U and Nintendo Switch versions of Minecraft through an update on January 30, 2018. This technically marks Banjo's first appearance on a Nintendo console since Banjo-Pilot on the Game Boy Advance, and additionally, technically his first appearance alongside Diddy Kong since his debut. 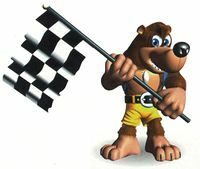 An in-game render of Banjo. Banjo is at the top-right of the character selection. This page was last edited on February 25, 2019, at 02:36.